VICTORIA, BC - Victoria Highlanders FC (4-7-0) travel south of the border to take on Seattle Sounders U-23 (4-4-3) in Week 10 of the Premier Development League (PDL) regular season, July 6 (7:30 PM PST KO) at Sunset Chevrolet Stadium in Tacoma, Washington. The Highlanders go on the road following a major 1-0 win versus rivals TSS FC Rovers. With the three points the Highlanders have sprung into a potential playoff run starting with Sounders U-23 as their first test. The match will be streamed online through the Sounders U-23’s Official Youtube Channel. Following a tough start to the season the Highlanders have turned things around with six points in their last three games. Coming back from a road trip down to Oregon the Highlanders hosted rivals TSS FC Rovers in a crucial match for any hope of making playoffs. Playoff Qualification Rules: In the Western Conference each division winner, plus the highest-finishing second-place team in the conference, advances to the playoffs in the conference semifinals. TSS came into the game needing three points to continue in their spot in second place. However, the home team had other ideas pressing TSS throughout much of the game. The game was very tight with few chances for both sides. At 84-minutes a foul committed in the box on Chris Rushworth gave a chance to Victoria to grab all three points. Captain Callum Montgomery slotted the penalty away to seal the victory in Victoria. The Highlanders travel to Tacoma looking for an opportunity to go level on points with the Sounders U-23 side who currently sit in second place. 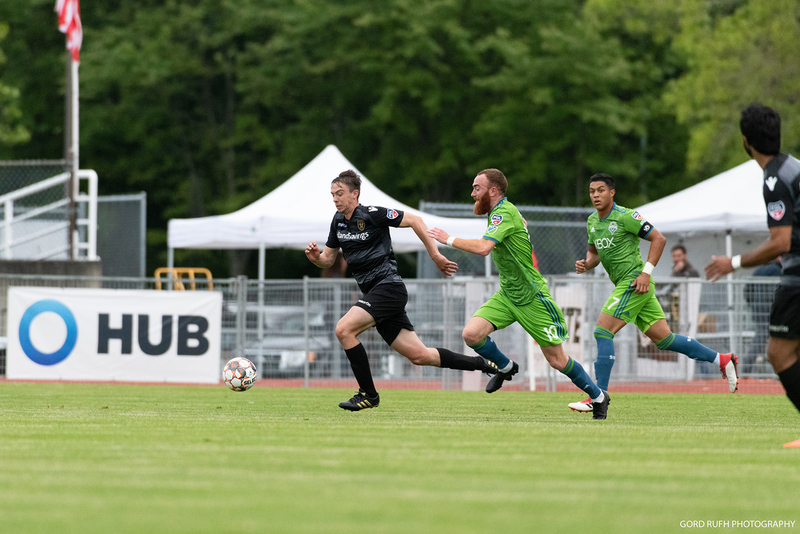 Seattle Sounders U-23 host the Highlanders following a big week with a convincing 4-0 win over Portland Timbers U-23 to move into a potential playoff spot. As Calgary has already secured a place in the playoffs and clinched the division title the second place team has a chance to make the playoffs. Sitting in second place Sounders U-23 will need to gain as many points as possible for any chance to move onto playoffs now competing with other divisions. With only four points sitting between last place in the division and second place anything is possible. The home side will not want to give up any points. Following the 4-0 win on the weekend the Sounders will enter this game on a wave of momentum. Key players to watch out for include forward Santiago Patino, Phillip Lund, and Edward Na. The Highlanders hold the upper hand in the two game 2018 series between these two clubs. On Friday, June 1 at Centennial Stadium, Sounders U-23 traveled to Victoria to take on the Canadian side. At 38-minutes a penalty was awarded to Seattle’s Santiago Patino. He converted the penalty to make it 1-0. Victoria entered the second half looking to grab the win and end the Sounders U-23’s unbeaten run. At 61-minutes a corner was sent in that was met by Marcus Campanile to equalize. Following mounting pressure from the home side, at 84-minutes a breakthrough was found to make it 2-1 sealing all three points. The goal was registered by Victoria’s Mitchell Popadynetz. The Highlanders return to UVic’s Centennial Stadium for their last game of the 2018 regular season Saturday, July 14 at 2:00pm. Tickets are available at www.highlandersfc.ca/tickets. For more information, please visit www.highlandersfc.ca.